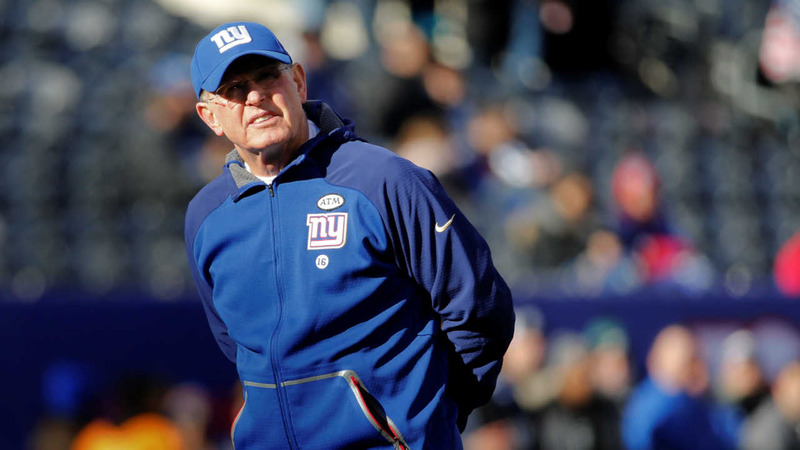 EAST RUTHERFORD, New Jersey -- After another dismal season, neither Tom Coughlin nor New York Giants management gave any indication whether the 69-year-old coach would be returning after missing the playoffs for a fourth straight. The final game for the Giants (6-10) was much like many others this season. New York had its chances and squandered them in a 35-30 loss to the Philadelphia Eagles. Co-owners John Mara and Steve Tisch aren't expected to wait long in making a decision on not only Coughlin, but also general manager Jerry Reese and personnel director Marc Ross. "The frustration continues," said Coughlin, who has a year left on his contract. "You've got your questions prepared for what direction I'm going in, I'm not going to answer anything about that. The season just ended, there will be time for that." There have been reports that Coughlin will resign, and some point to his having his family on the sideline at the end of the game as evidence of that. However, Coughlin is a fighter so walking away seems out of character. The Giants had a great chance to win for Coughlin on Sunday. They were ready to take a 13-point lead late in the third quarter when they game changed on an 83-yard fumble return for a touchdown by former Giant Walter Thurmond after Eli Manning was sacked. "Everyone in this organization tried real hard not to talk about it, but we knew who we were playing this game for, and let's finish," Giants cornerback Prince Amukamara said. "It feels like we let that person down." The Eagles (7-9) didn't wait for the end of the season to start changing things. Chip Kelly was fired Tuesday after Philadelphia missed the playoffs for the second straight season. Kelly was given control of personnel moves this season and he made a lot of bad ones, releasing three-time Pro Bowl wide receiver DeSean Jackson, trading two-time All-Pro running back LeSean McCoy and signing running back DeMarco Murray. Sam Bradford, who Kelly acquired from the Rams, threw two short touchdown passes to Jordan Matthews, the last one with 9:19 to play to give the Eagles a 35-27 lead to get a win for interim coach Pat Shurmur. "After going through what we went through this week, it wasn't easy on anyone," said Bradford, who was 30 of 38 for 320 yards. "I'm so proud of the guys in that locker room and the way they rallied around Pat." Josh Brown added his third field goal for the Giants with 4:30 to go to cut the gap to five points. New York's defense got the ball back with 1:43 to play, but the offense turned the ball over on downs at their own 42. Rashad Jennings rushed for a season-high 170 yards and scored a touchdown for the Giants. Manning threw touchdown passes of 9 yards to Will Tye and 45 to Rueben Randle. "That is a guy that has so much command in the room, so much respect amongst his peers and us," Jennings said of Coughlin. "We will fight for him, continue to follow him and there is no doubt in my mind that (he) is the man for the job." BECKHAM BACK: Coming back from a one-game suspension for multiple violations of player-safety rules, Odell Beckham Jr. had five catches for 54 yards. He was pretty invisible most of the game. SHURMUR FUTURE: Like Coughlin, Shurmur doesn't know what the future holds for him with his current team. "I tried to segment my thoughts and my feelings" Shurmur said. "I just wanted to do my job, and finish my job for Mr. Lurie today by coaching this game." ERTZ AGAIN: Zach Ertz had another monster game for the Eagles. The tight end caught nine passes for a career-best 152 yards, topping the previous high of 122 set the week before. CAN'T COVER ANYONE: The Giants finished the season giving an average of 298.9 yards passing. No NFL has gone through a season yielding an average of 300 yards. Bradford's 78.9 completion percentage was the highest ever by an Eagle with more than 30 attempts. INJURIES: Giants S Brandon Meriweather left the game with a knee injury and his replacement Trumaine McBride had a concussion. Giants Linebacker Uani Unga also left with a concussion. ..Eagles WR Nelson Agholor sustained concussions on the play that McBride tackled him. NOTES: Eagles not only finished second in the NFC East, they avoided a game in London against the Rams. That now falls to third-place Giants. ... Philadelphia has won four in a row and five of six against New York. ... The Giants scored 420 points this season, the fifth-highest total in franchise history. They allowed 442 points, the second-highest total in franchise history (501 in 1966).